Civil Engineering Division, The Institution of Engineers, Bangladesh, Headquarters, Ramna, Dhaka 1000, Bangladesh. 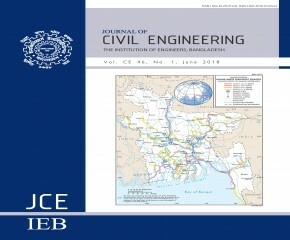 The Journal of Civil Engineering (JCE) is the flagship journal of the Civil Engineering Division, The Institution of Engineers, Bangladesh (IEB). The Journal aims at providing an emerging channel for publication of original research so that the engineers can exchange and share professional, technical and academic knowledge on any aspect of Civil Engineering discipline, e.g. environmental engineering, geotechnical engineering, structural engineering, transportation engineering and water resources engineering. Original works related to surveying technology are also welcome (see Scope for details). As the oldest forum (see History for details) in Bangladesh for publishing original research work in the field of civil engineering, the Journal also aims to stand as an archival record of the technical advances of the Institution and the profession, in general.